James Harden turned in an incredible performance night to earn the title of #NBAFantasy Player of the Night! Greg Sussman from FNTSY Sports Network is here to recap all of the top performances from yesterday’s action! Russell Westbrook notched another triple-double last night to earn the title of #NBAFantasy Player of the Night! Greg Sussman from FNTSY Sports Network is here to recap all of the top performances from yesterday’s action! LeBron James and Lonzo Ball each record a triple-double for the first time since Magic Johnson and Kareem Abdul-Jabbar accomplished the feat in 1982 to lead the Lakers over the Hornets, 128-100. Played in 62 games with 62 starts as a sophomore, averaging 7.2 points, 5.2 rebounds, 0.8 assists, 0.7 steals and 0.6 blocks in 24.2 minutes… Shot a career-best 47.3% from the field, 11.1% from 3-point range and 61.4% from the free throw line. 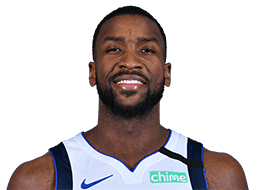 Played in 78 games with 77 starts as a rookie, averaging 9.0 points, 5.8 rebounds and 1.5 assists in 26.0 minutes… Named to the All-Rookie Second Team… Ranked 39th in the NBA in blocks… Ranked fifth among NBA rookies in rebounding, ranked sixth in scoring and blocks, tied for seventh in minutes played, ranked ninth in field goal percentage (.458) and 11th in assists… Selected to play in the 2013 BBVA Rising Stars Challenge at All-Star Weekend… Named Eastern Conference Rookie of the Month for November… Scored in double figures 35 times, including four games of 20 points or more… Grabbed 10 or more rebounds six times… Recorded six double-doubles… Led or tied for the team lead in scoring four times, in rebounding 16 times, in assists twice, in steals 10 times and in blocks 25 times… Recorded two games with 25 points and 12 rebounds, joining LeBron James as the only two players in NBA history to tally at least 25 points and 12 rebounds in a game twice before their 20th birthday… Had 25 points and 12 rebounds the first time on November 10 against Dallas when he was 19 years and 45 days old, becoming the second-youngest player ever to do so... Also did so on December 19 against Phoenix, when he was 19 years and 84 days, which was the third-youngest ever… Became just the fourth player in the last 20 years to post multiple games with at least 25 points and 12 rebounds in the first 25 games of their career, joining Blake Griffin, Charlie Villanueva and Yao Ming as the only four players to do so since 1993… Grabbed a career-high 14 rebounds on April 5 against Miami… Recorded a career-high five steals on November 3 against Dallas… Recorded a career-high 41 minutes on November 10 against Dallas. Selected by the Bobcats with the second overall pick in the 2012 NBA Draft. Played one season at Kentucky, averaging 11.9 points, 7.4 rebounds, 1.9 assists, 1.0 steal and 0.9 blocks, while shooting .491 from the field and .745 from the free-throw line… Named Second Team USBWA All-American and Third Team NABC All-American, and was a top-15 finalist for the John R. Wooden Award, top-30 finalist for the Naismith Men’s Basketball Player of the Year Award and one of five finalists for the Wayman Tisdale Award, given to the nation’s top freshman as voted on by the USBWA… SEC honors included First Team All-SEC, SEC All-Defensive Team and SEC All-Freshman Team.